It is school policy that every child is expected to wear school uniform. We believe that this encourages children to be proud of themselves and their school. It also helps to ensure that all children are treated alike. Clothing with stripes/patterns or with other logos on are not allowed, neither are jeans. 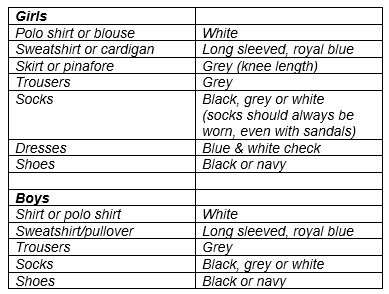 Knee length grey shorts may be worn by boys and girls. All children are required to have a royal blue t-shirt and navy shorts for PE with sandshoes/trainers for indoors and trainers for outdoors. Younger children should be able to dress independently so please do not send them in with laces until they are able to tie their own laces. ALL ITEMS OF CLOTHING, BAGS, PE KITS, CAPS etc SHOULD BE CLEARLY NAMED.